x1. Tunçbilek E (1996) Turkiyede malformation incidence, distribution, and risk factors for neonatal andrometrik the evaluation exist. Tubitak Matbaası Ankara 94.
x2. Cohen SR, Kalinowski J, LaRossa D, Randall P (1991) Cleft palate fistulas: a multivariate statistical analysis of prevalence, etiology, and surgical management. Plast Reconstr Surg 87: 1041-7.
x3. Smith DM, Vecchione L, Jiang S, Ford M, Deleyiannis FW, et al. (2007) The Pittsburgh fistula classification system: a standardized scheme for the description of palatal fistulas. Cleft Palate Craniofac J 44: 590-4.
x4. Inman DS, Thomas P, Hodgkinson PD, Reid CA (2005) Oro-nasal fistula development and velopharyngeal insufficiency following primary cleft palate surgery-an audit of 148 children born between 1985 and 1997. Br J Plast Surg 58: 1051-4.
x5. Claman L, Alfaro MA, Mercado A (2003) An interdisciplinary approach for improved esthetic results in the anterior maxilla. J Prosthet Dent 89: 1-5.
x6. Andrew JA, Bigg WF (1999) Andrew’s bar and sleeve retained bridge: a clinical case report. Dent Today 18: 94-6, 98-9.
x7. Everhart RJ, Cavazos E (1983) Evaluation of a fixed removable partial denture: Andrews bridge system. J Prosthet Dent 50: 180-4.
x8. Fields H, Birtles JT, Shay J (1980) Combination prosthesis for optimum aesthetic appearance. J Am Dent Assoc 101: 276-9.
x9. 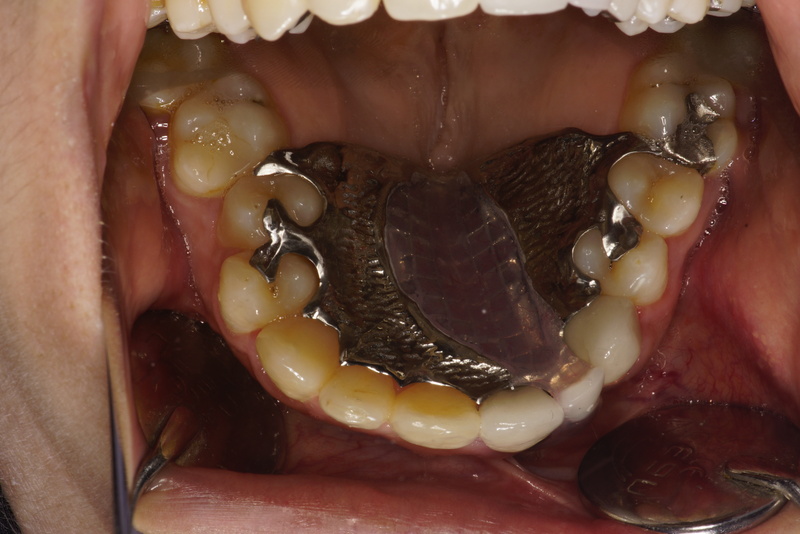 Immeleus JE, Aramany MA (1975) fixed-removable partial denture for cleft palate patients. J Prosthet Dent 34: 286-91.
x10. Abrams H, Kopczyk RA, Kaplan AL (1987) Incidence of anterior ridge deformities in partially edentulous patients. J Prosthet Dent 57: 191-4.
x11. Garber DA, Rosenberg ES (1981) The edentulous ridge in fixed prosthodontics. Compend Contin Educ Dent 2: 212-23. 7. Everhart RJ, Cavazos E (1983) Evaluation of a fixed removable partial denture: Andrews bridge system. J Prosthet Dent 50: 180-4. 8. Fields H, Birtles JT, Shay J (1980) Combination prosthesis for optimum aesthetic appearance. J Am Dent Assoc 101: 276-9. 9. Immeleus JE, Aramany MA (1975) fixed-removable partial denture for cleft palate patients. J Prosthet Dent 34: 286-91. Copyright: © 2018 Uğur M. This is an open-access article distributed under the terms of the Creative Commons Attribution License, which permits unrestricted use, distribution, and reproduction in any medium, provided the original author and source are credited. The Cleft Lip and Palate (CLP) is difference of a type of clefting congenital anomaly caused by abnormal facial development during pregnancy. The etiology of CLP is still unknown but there are possible causes such as malnutrition and irradiation during pregnancy, psychological stress, teratogenic agents, infectious agents (viruses), and inheritance. Oro-nasal fistula is the most common complication after the surgical closure of the cleft palate. Prosthetic rehabitation of the anterior maxilla is important for these patients. Retention is the significant factor in the successful prosthodontic rehabilitation of cleft palate patients. CLP is needing complex treatment strategies scheduled in many years of duration. These patients require various treatments involving a multidisciplinary team, which may include a maxillofacial surgeon, an orthodontist, prosthodontist, an ear nose and throat specialist (ENT), speech therapist and all those professionals who can help provide functional and aesthetic improvement. The palatal defects can be either congenital or acquired. In Turkey, the incidence of cleft lip and palate is 1 in 1000 live births and majority of these patients are not treated surgically at the appropriate time . Palatal fistula is a common complication arising out of cleft palate repair and its occurence ranges from 0-34 % as observed in various studies . It was found statistically that the width of 15 mm or more had a significant risk of fistula formation. Smith, et al. classified the palatal fistula into seven types . Type I - referred to bifid uvula. Type II - means fistula in the soft palate. Type III - means fistula at junction of the soft and hard palates. Type IV - means fistula in the hard palate. Type V- indicates that the fistula at junction of the primary and secondary palates. Type VI - means lingual alveolar fistula. Type VII - means labial alveolar fistula. The patient with a unilateral or bilateral cleft palate, missing anterior teeth and a deficient alveolar ridge presents the problem of restoring the missing teeth and the alveolar ridge . The increasing demand for esthetics in restorations can be met with any of ceramic restoration systems currently available. However, the esthetic value of a cosmetic restoration may be compromised by other factors contributing to the composition of a pleasant smile, such as amount of gingival display, gingival architecture, clinical crown dimensions and tooth position . ▶ Cleft palate patients [7-9]. 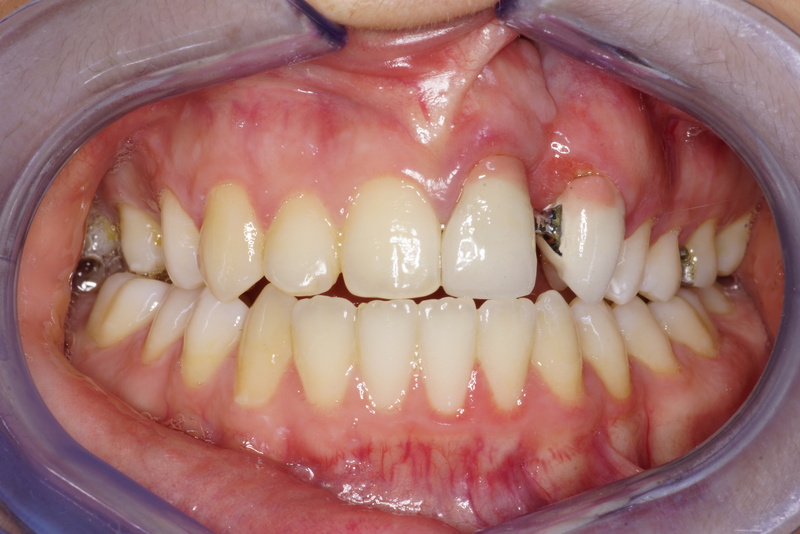 The aim of the present a case having ridge defect, which was restored successfully by using fixed-removable Andrews’s bridge system. An 18 year old male was referred to the Department of Prosthodontics from the Department of Oral and Maxillofacial Surgery, Ondokuz Mayıs University, Dentistry Faculty, for the prosthetic rehabilitation of the palatal fistula after the primary surgical closure of cleft palate. Intraoral examination revealed maxilla with a Veau’s class III defect (unilateral cleft lip, alveolus, hard and soft palate) and missing left lateral incisor. Extra oral examination revealed a surgical scar on the upper lip due to previous surgical correction of cleft lip. Her speech was not intelligible with a nasal twang in her voice lacking resonance. 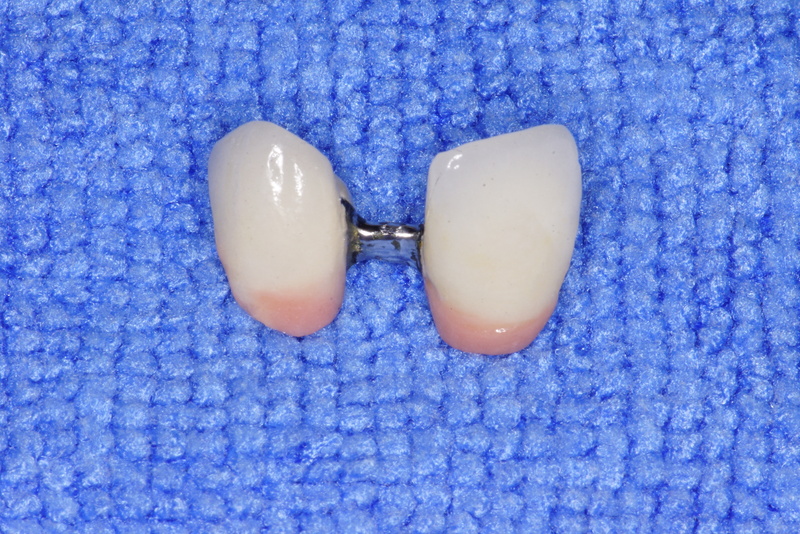 The selected abutment teeth were prepared for receiving metal ceramic crowns (Figure 1). Impressions were made using the putty wash impression technique(Express STD Putty 3M, ESPE, USA and Express Light body STD Quick Wash, 3M ESPE, USA) and master casts were poured in the dental stone (Type IV die stone- Gyproc, InZhermack, Rovigo, Vêneto, Italy). Wax patterns were fabricated on the prepared abutment teeth and were connected using a preformed plastic bar attachment. This entire assembly was then cast in chrome cobalt alloy. The finished and polished metal framework was tried in the patient’s mouth for proper fit and clearance between the bar attachment and underlying soft tissues (Figure 2 and 3). The missing teeth were arranged on the wax occlusal rim fabricated on to the edentulous area of the cast and tried for aesthetic approval by the patient. The removable part of Andrew’s bridge was then fabricated using heat cured polymethylmethacrylate (PMMA) resin (Dental Products of India DPI, Mumbai). Plastic clip and metal housing were placed on to the cast bar before packing of acrylic resin. Metal copings were then veneered with ceramic and the whole restoration was finished and polished (Figure 4). The fixed component of the Andrew’s system was cemented over the prepared teeth. After 1 hour a removable component was inserted and occlusal adjustments were carried out (Figure 5aand 5b). The patient was recalled after the first day then after a week. The patient was happy with the aesthetics and functions of the prosthesis and was advised for regular recall visits. The most commonly seen defects are the combined Class III defects (56% of cases), followed by horizontal defects Class I (33 % of the cases) . Vertical defects were reported to be found in 3% of the patients . Large vertical and horizontal bone defects pose a prosthodontic challenge as it is difficult to restore esthetics and function along with the complete closure of the defect. Such clinical conditions are not successfully treated by conventional fixed or removable prosthesis. Prosthodontist play a very important role in complete rehabilitation of cleft lip and palate patients for successful rehabilitation of such patients, a team approach of concerned specialist with phase wise, unanimous and systematic treatment plan is essential. Prosthodontic rehabilitation of these patients is usually around the age of 20, before which the patient will be treated by surgeons for surgical primary closure, orthodontists for alignment of teeth and finally by prosthodontist for the replacement of missing teeth and obturation of the defect. Palatal fistula is a common complication of cleft palate surgical repair observed in different studies and to correct inevitable sequel of the surgery, the prosthetic rehabilitation with obturator is an auxiliary or complementary treatment to surgical treatments. The advantages of the Andrew’s bridge system are adequately reported in the literature, which includes better aesthetics, hygiene along with better adaptability and phonetics. It is comfortable and economical for patients. There is no palatal extension as in the case of removable partial dentures. Good soft tissue response due to less soft tissue impingement. This type of prosthesis is more retentive and stable with minimal extension. The system avoids transfer of unwanted leverage forces to the abutment teeth by acting as a stress breaker [6,7]. Andrews Bridge System is a fixedremovable prosthesis that is indicated in patients with large ridge defects. The functionally fixed prosthesis successfully replaces the missing teeth along with complete closure of the defect, restores speech and esthetics.